Beautiful Tropical Retreat with Stunning Sunset Views!! Spacious and like new 3 BR 2.5 BA at one of Marathon, Florida Keys most prestigious resorts, "Indigo Reef Marina Resort the Florida Keys" ~ Magnificent views from this home. Guests to Indigo Reef enjoy this private gated community for it's in town convenience but secluded tropical locale. The community heated pool and exercise room will be the highlight of your Florida Keys vacation at Indigo Reef. This fabulous Marathon Florida Keys Vacation Rental Resort Home at Indigo Reef is absolutely spectacular. The views of the tranquil, open water of the Gulf of Mexico are amazing from both the upper and lower level deck. Guests to Indigo Reef Seaside Escape will enjoy its remote location within the resort which provides for one covered parking space but also is located next to the guest parking area. Step out of your Master Suite and step into Paradise on your upper-level private deck which features magnificent views of the Florida Keys Sunset. The lower deck boasts equally exquisite sunset views and is perfect for children as there are no steps off this level. Indigo Reef Homes is laid out beautifully with a deck, fully equipped kitchen, living room, and dining plus guest bath on the first level. On the second level, the Master Suite has a deck of its own and also adds its own private bath. There are two more bedrooms on the second level plus an additional guest bathroom for convenience and a Washer and Dryer. In all of the Florida Keys, Indigo Reef stands out as one of the most tasteful resorts that we have to offer. Indigo Reef Resort features an amazing landscape characterized by native flora surrounding the entire complex which is laid out with a specific goal of 'Tropical Relaxation' in mind. The interior of this home is equally exquisite with space and luxury in focus. Seaside Escape has been updated with new tropical decor furnishings in the living and dining areas. Docking - We can arrange Boat Trailer parking for you and guide you to the best boat ramp for your needs. Bedrooms/Accommodates (3/6) - The master suite features a king mattress and the other two bedrooms feature a queen mattress and two twins respectively. Beach/View - This resort home features a remarkable view from both the upper and lower level decks, living room and Master Suite. 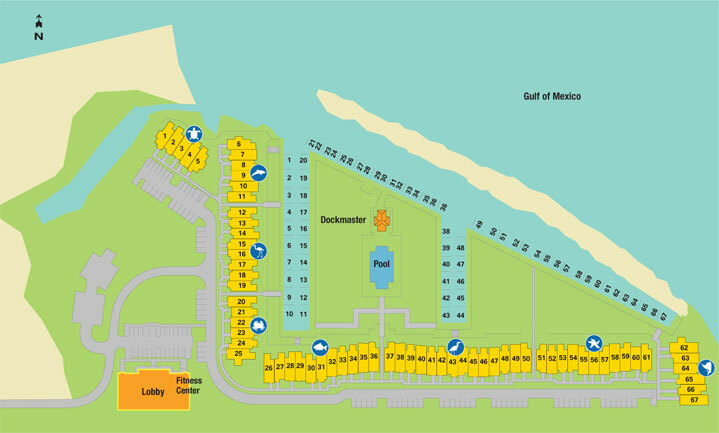 Sombrero Beach Marathon is a ten-minute drive from the Resort and Coco Plum Beach is 5 minutes. Location - Traveling route 1 south, turn right on 117th street immediately after the Vaca Cut bridge around Mile Marker 53. Veer around the corner to the left and turn right into Indigo Reef Resort. Just wanted to let you know we had a great time at Indigo Reef. The villa was perfect. Looking forward to our next stay there. "A beautiful location to explore the Keys"
We stayed in Seaside Escape for a week. The condo is very large and nice. Everything was very clean. Having a full kitchen and washer and dryer was great for our family of four. The place was so big, however, that we wished we had brought other friends or family. Three bedrooms and two full bathrooms on the second floor. The full kitchen, dining room, bathroom, and family room on the first floor. Having the ocean front deck on both the main floor and off the master was great and the sunset views were tremendous. Convenient location in the middle of Marathon with the best coffee and best dessert places right across the street. All in all, we were very happy and would consider staying here again. Your home comes with a carport which is located near the unit and it is numbered. You may use this carport only for your primary vehicle. One extra vehicle may be parked immediately near the home and other additional cars may be parked in either of the overflow parking lots located to the left and right of the main drive as you enter the resort.